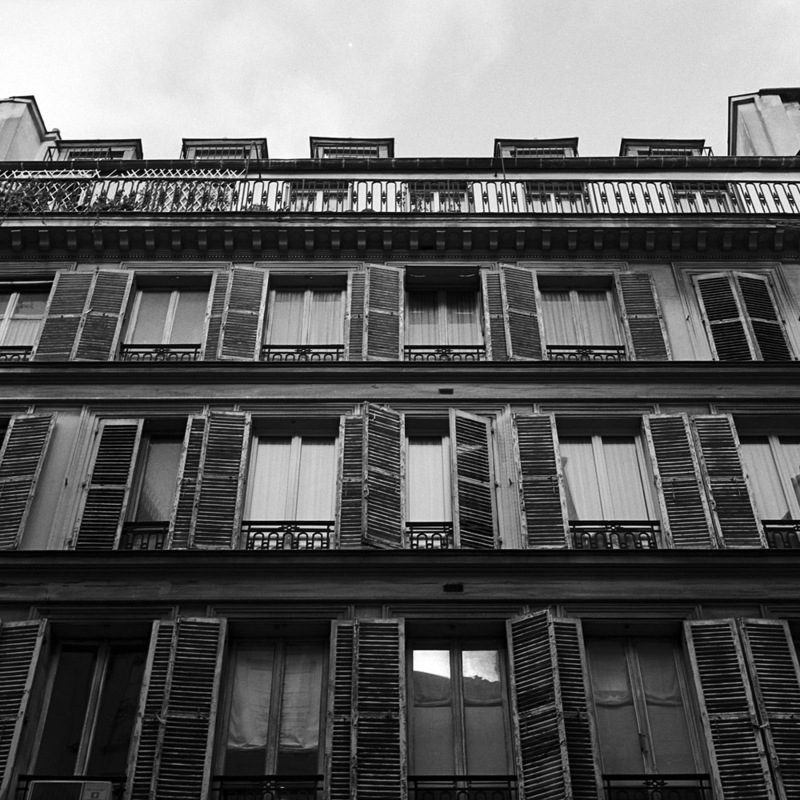 A photographer’s visit to Paris would not be complete without a trip to the Maison Europienne de la Photographie. The primary exhibit was Sebastiao Salgado’s current body of work documenting indigenous ways of life and remote places around the world. It would have been very hard to photograph the exhibit itself as it was VERY crowded, so I turned my lens toward the building. The entrance is a very modern looking (read 1960s style) wing, but the main block of the facility is housed in another one of those 18th century Parisian hotels that once belonged to some noble family. After visiting La Maison, my father and I ate here at Les Chimeres for lunch. 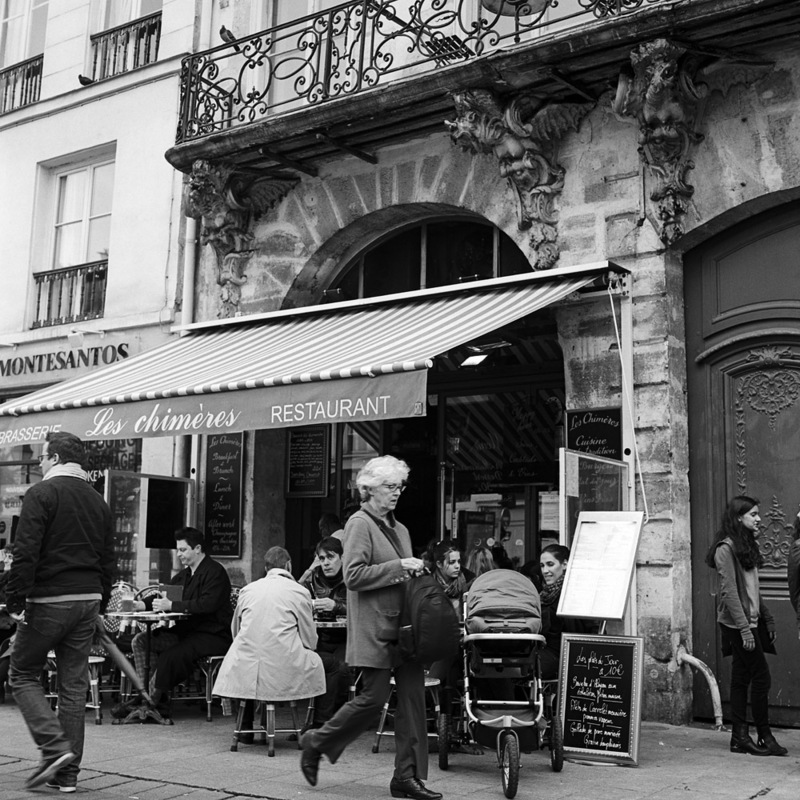 It was a fairly chilly (for October) day, and you can see Parisian cafe culture at work – despite the chill, people were sitting outside of their own free will. This was true across the city, and in all weather (it took a brisk rain to drive people inside completely). 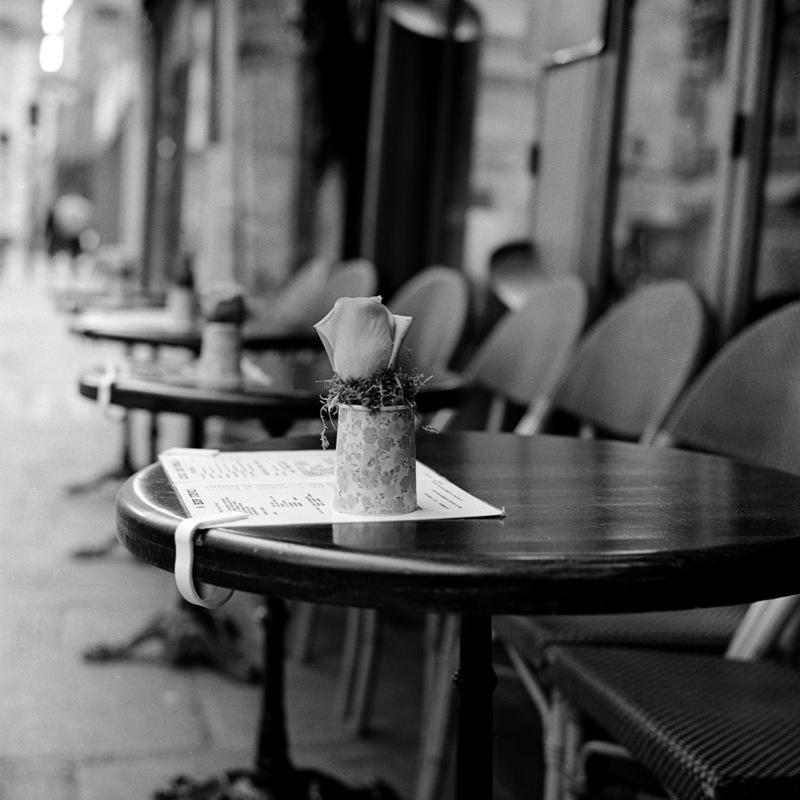 Near the Pompidou Centre, I came upon this row of cafe tables set up and waiting for patrons. I know it’s a bit treacly and cliché as photos go, but it’s representative of the place and the atmosphere. 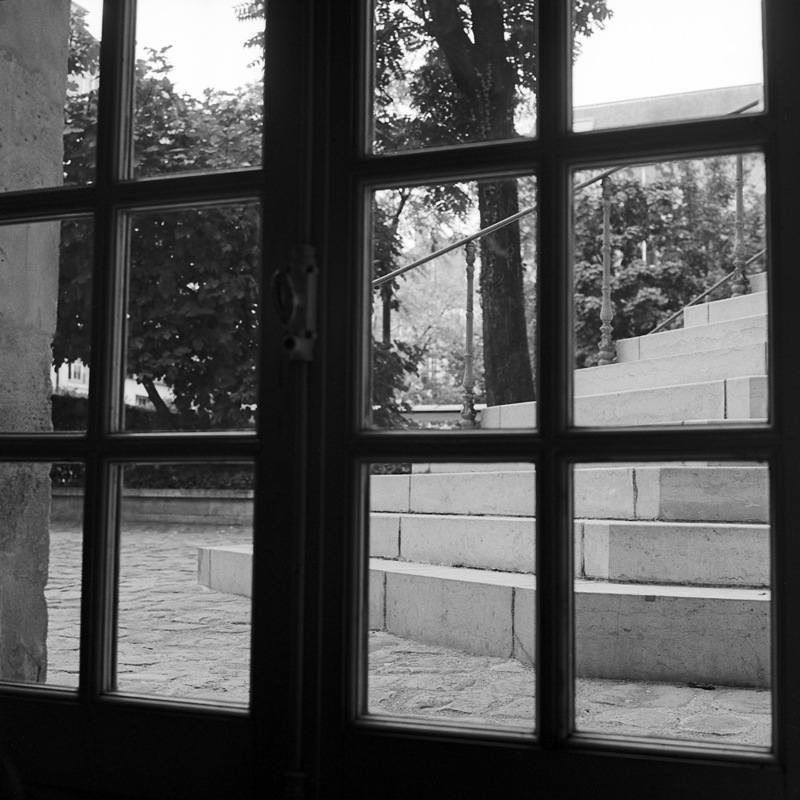 Around the corner from La Maison and Les Chimeres was this scene. 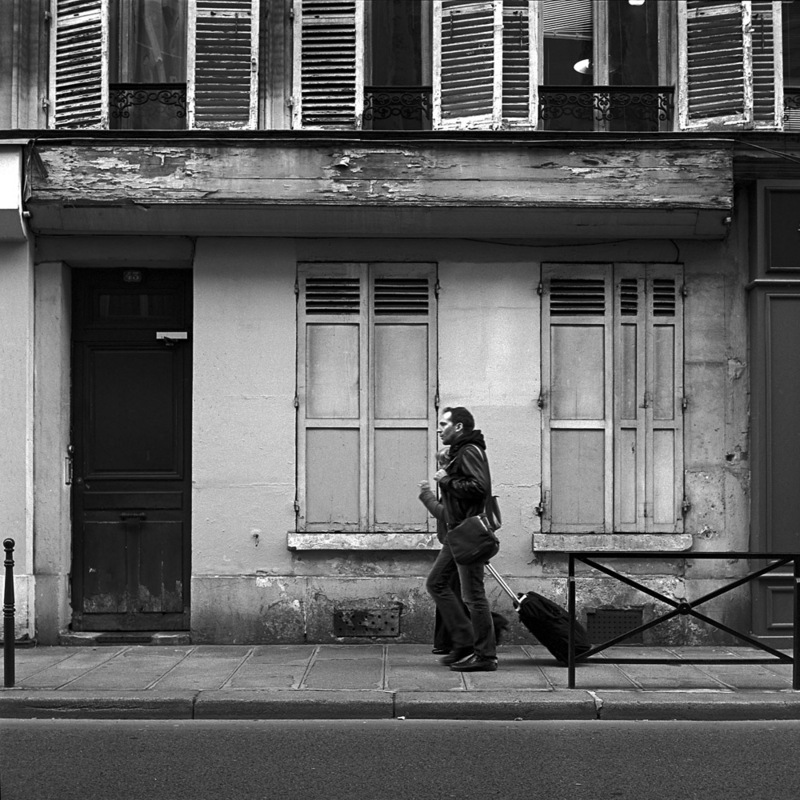 Number 43, Rue Francois Miron. I have no idea if anyone famous or noteworthy lived (or lives) there, but the weathered texture and the irregular symmetry and repeating patterns of the building cried out to be photographed. I love looking up at buildings – it’s sometimes hard to do, and it forces you to break out of your street-level perspective. In places like New York, where the buildings are so tall, it can almost induce a sort of negative vertigo, but it still behooves us to stop and re-think how we see the world. Plus, you might miss something interesting if you don’t. 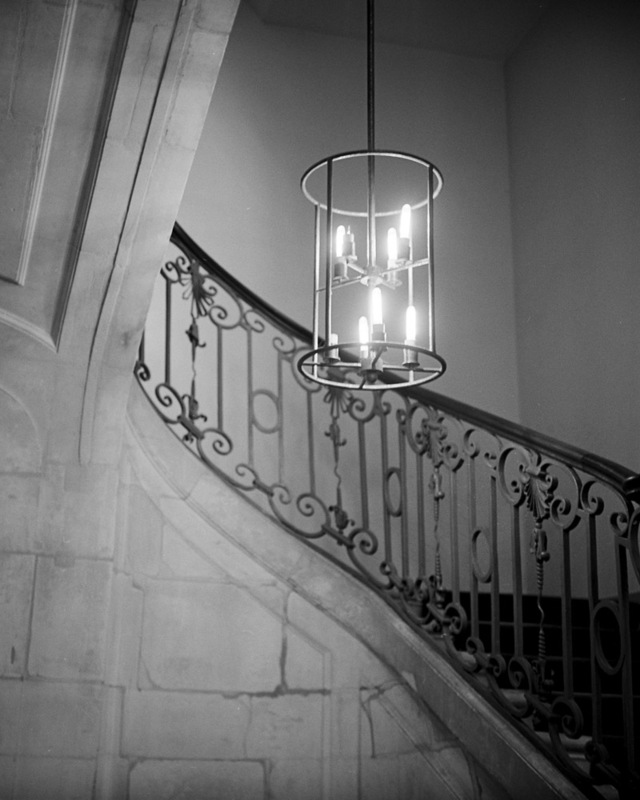 Again, everything was shot with a Rolleiflex 2.8E, on Kodak Tri-X film.